It must have been in the early twenties, I only have a very dim, vague, memory. And yet, the flashes that rise in my bosom are unfailingly clear. They have been my silent inspiration. They have helped me more often than I dare to confess. 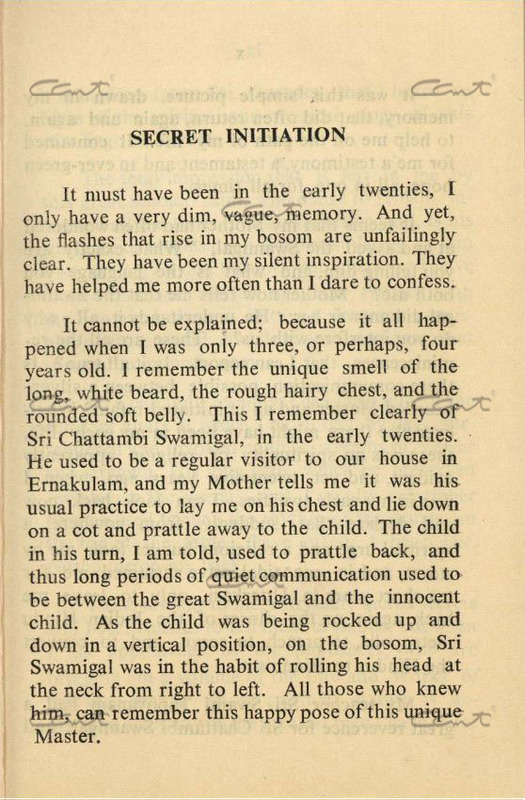 Sri Chattambi Swamigal, in the early twenties. 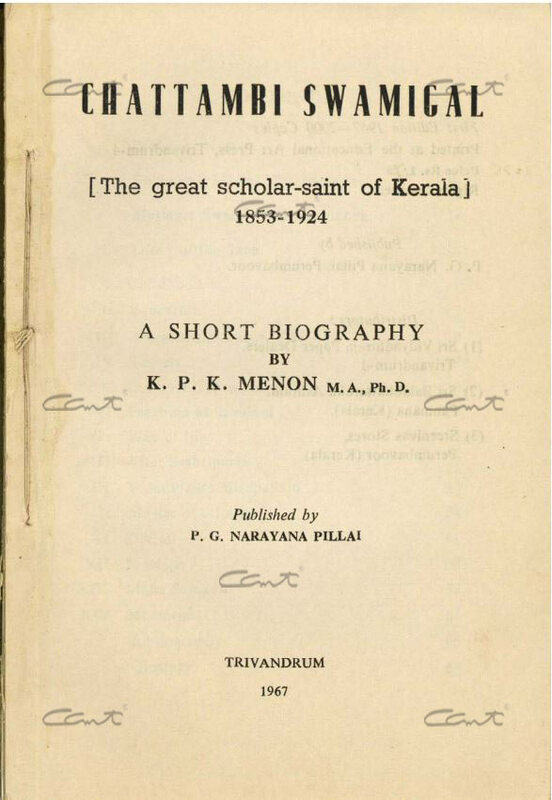 He used to be a regular visitor to our house in Ernakulam, and my Mother tells me it was his usual practice to lay me on his chest and lie down on a cot and prattle away to the child. The child in his turn, I am told, used to prattle back, and thus long periods of quiet communication used to be between the great Swamigal and the innocent child. As the child was being rocked up and down in a vertical position, on the bosom, Sri Swamigal was in the habit of rolling his head at the neck from right to left. All those who knew him, can remember this happy pose of this unique Master. It was this simple picture, drawn in my memory, that did often return, again and again, to help me on the path of my life. It contained for me a testimony, a testament and an ever-green hope, all in one, for all times. 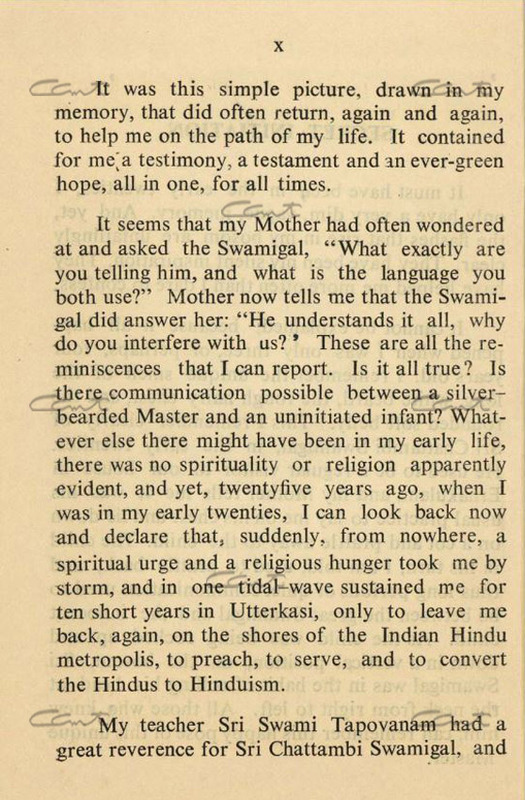 It seems that my Mother had often wondered at and asked the Swamigal, “What exactly are you telling him, and what is the language you both use?” Mother now tells me that the Swamigal did answer her: “He understands it all, why do you interfere with us?” These are all the reminiscences that I can report. Is it all true? Is there communication possible between a silver-bearded Master and an uninitiated infant? Whatever else there might have been in my early life, there was no spirituality or religion apparently evident and yet, twenty five years ago, when I was in my early twenties, I can look back now and declare that, suddenly, from nowhere, a spiritual urge and a religious hunger took me by storm, and in one tidal-wave sustained me for ten short years in Utterkasi, only to leave me back, again, on the shores of the Indian Hindu metropolis, to preach, to serve, and to convert the Hindus to Hinduism. 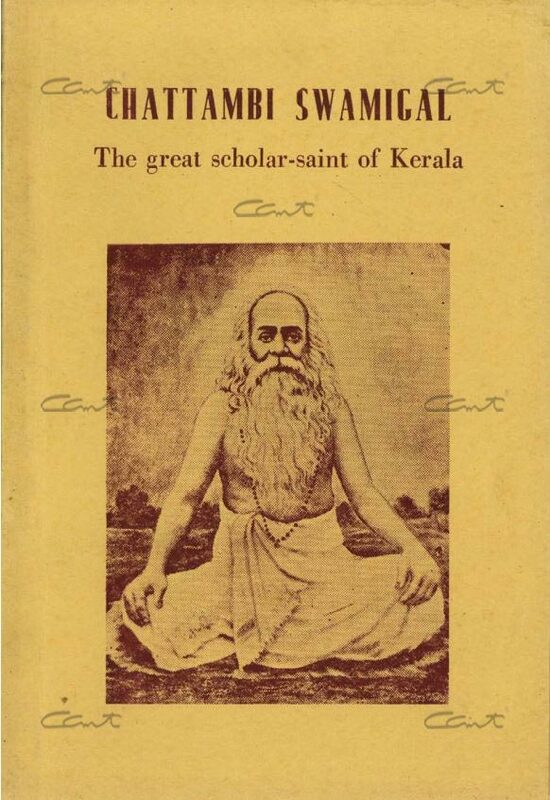 My teacher Sri Swami Tapovanam had a great reverence for Sri Chattambi Swamigal, and it is in fact from Sri Gurudev that I heard so often of the spiritual and mystical glory of this rare Sage of Kerala. 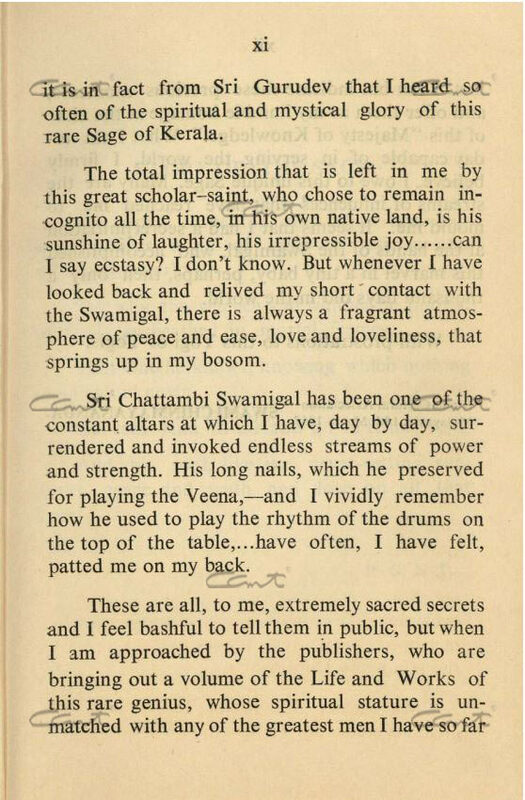 The total impression that is left in me by this great scholar-saint, who chose to remain incognito all the time, in his own native land, is his sunshine of laughter, his irrepressible joy……can I say ecstasy? I don’t know. But whenever I have looked back and relived my short contact with the Swamigal, there is always a fragrant atmosphere of peace and ease, love and loveliness, that springs up in my bosom. Sri Chattambi Swamigal has been one of the constant altars at which I have, day by day, surrendered and invoked endless streams of power and strength. His long nails, which he preserved for playing the Veena,- and I vividly remember how he used to play the rhythm of the drums on the top of the table,….have often, I have felt, patted me on my back. These are all, to me, extremely sacred secrets and I feel bashful to tell them in public, but when I am approached by the publishers, who are bringing out a volume of the Life and Works of this rare genius, whose spiritual stature is unmatched with any of the greatest men I have so far met, I can but indicate these precious moments, and offer them as my humble homage at the altar of this “Majesty of Knowledge.” What I am today capable of in serving the world, I firmly believe, I owe to this unique Sage. Many are the streams of influences that have reached me, to mould me. 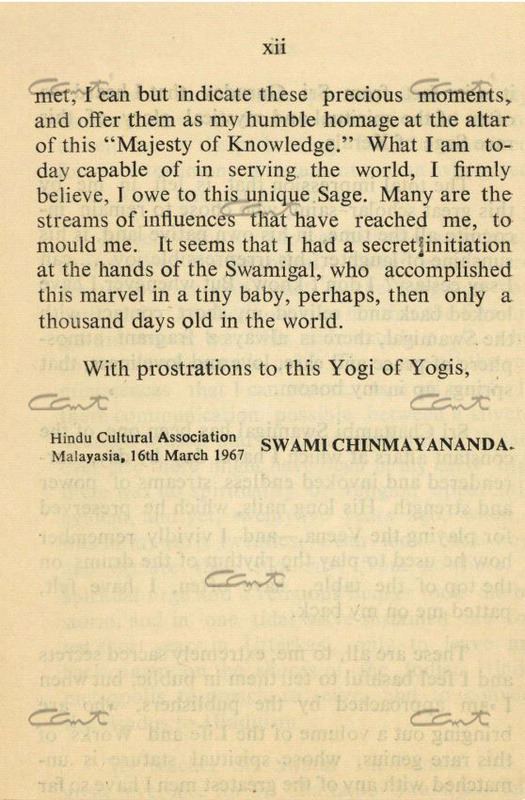 It seems that I had a secret initiation at the hands of the Swamigal, who accomplished this marvel in a tiny baby, perhaps, then only a thousand days old in the world.